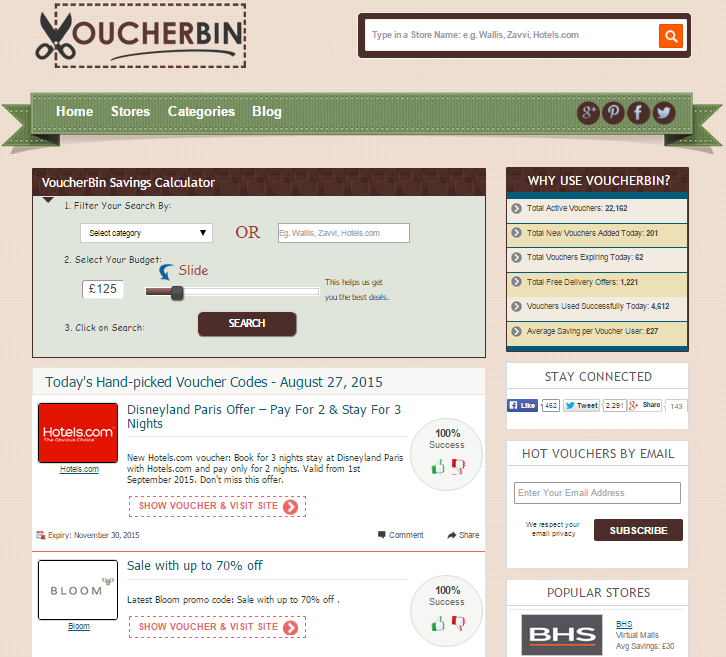 Voucherbin is a UK voucher site that offers great discounts on your online shopping. There are loads of different stores and offers available so it is worth having a look at before you shop. The homepage has deals that have been specifically picked for that day and include some of the biggest savings. For example, there is a pay for 2 and stay for 3 night offer at Disneyland Paris through Hotels.com or Selfie sticks for only £4.99… and let’s face it, everybody wants a Selfie stick! Wide range of offers including discounts on shopping, travel and services like parking and insurance. Ability to search for offers based on what type of product you are buying, the store you want to buy it from and your budget. Blog full of really useful tips and product reviews. Facebook, Google+, Twitter and Pinterest pages so that you are kept constantly up-to-date. Users can comment and give the vouchers a thumbs up or down so it is easy to see how useful they are. The blog covers everything from getting a good night’s sleep and unique holidays to DIY Christmas decorations and saving money the cost of your wedding. You can also subscribe to their mailing list to have vouchers sent right to your inbox. Quite a few of the codes didn’t seem to be working correctly when I tried to use them on the websites. The links to the stores’ websites open in a bit of a weird way. And they don’t take you directly to the products that you are searching for – you need to go through the website and look for the items yourself. There’s not really a ‘how to’ section for accessing the voucher codes so you just have to bumble through on your own. Some of the code screens will just say ‘ACTIVATED’ and this means that the saving is automatically taken into account when you’re browsing. Voucherbin is for online purchases only – great if you love online shopping but not so good if you want to go and try things on. Voucherbin gives users the opportunity to save a lot of money on their online shopping. There’s a huge amount of products on offer which means that there is literally something there to please everyone. Whilst you may need to try a couple of codes to get the best deals, it is definitely worth having a browse.